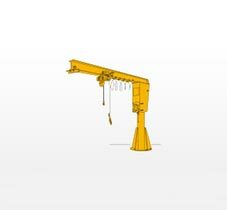 Over the years, we as a Supplier, Exporter and Importer, have been able to establish ourselves as a prominent figure in this industry by offering Pillar Shaped Jib Crane. The offered jib crane is made from high quality material and globally accepted technology. It has an elegant design to give optimum performance and easy to install. It is used in various material handling sectors. Our jib crane is offered to our patrons on industry competent rates. Pillar-shaped jib crane was equipped with a jib mechanism that I beam is pivoted, it is self-supporting of the crane can be installed even inside and outside anywhere in the building with a simple foundation work. I beam pivots 360 degrees, ideal for dedicated work in the work or under large crane in the dead zone of the building. The coupling portion and the rotation of the mast and beam employs a unique structure, achieve a smooth turning and outstanding durability. Electric swivel to exert power in remote or fine movement work is also available.The precision work, we recommend a combination of a two-speed form hoisting machine.